Why Choose Neograft (Follicular Unit Extraction) Technique? Neograft Hair Transplantation and is an alternative to the old strip method (FUG) which causes a large linear scar at the back of the head. This scar is often referred to as smiley face scar and can be visible in men and women with short hair styles. Neograft Hair Transplant was the first FDA approved FUE (Follicular Unit Extraction) method that is both minimally invasive and long-lasting. Neograft doesn’t leave a linear scar – making it a great choice for short hairstyles and is ideal for men and women of all ethnicities. If you hate the idea of “going under the knife,” NeoGraft is the right fit for you. Rather than using a scalpel the Neograft system offers an automated method to removes individual follicles from the donor site at the back of the head. 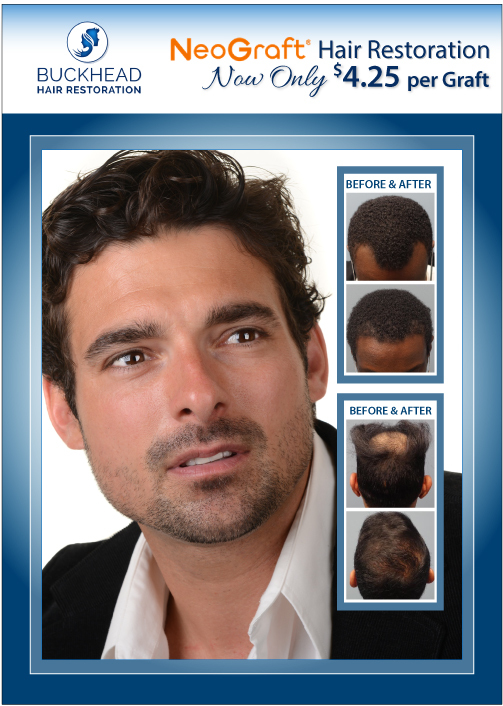 After the follicles are extracted (2-6 hairs), our team implants them into areas of the scalp where the hair is sparse. The hair in the donor area has to be cut short or shaved, however, the hair on top can often cover this area. If you are balding in the crown area, chances are that you have to keep your hair in a short style until the hair grows back. Our Atlanta based Hair Clinic offers the medical expertise from our trained team and Dr. Slater. Dr. Monte Slater is a double board-certified physician with 30 years of experience in medicine and over a decade of experience in Aesthetics and Anti-Aging. Buckhead Hair Restoration is located within the office of Aesthetic Body Sculpture Clinic & Center of Anti-Aging in Atlanta at 4840 Roswell Road NE. Visit slatermd.com for additional services offered. Our Hair Restoration Team will gladly set you up for a free hair analysis and Dr. Slater is committed to providing individualized treatment options for your hair loss. Book your complimentary consultation to find out if FUE Hair Transplantation is an option for you.